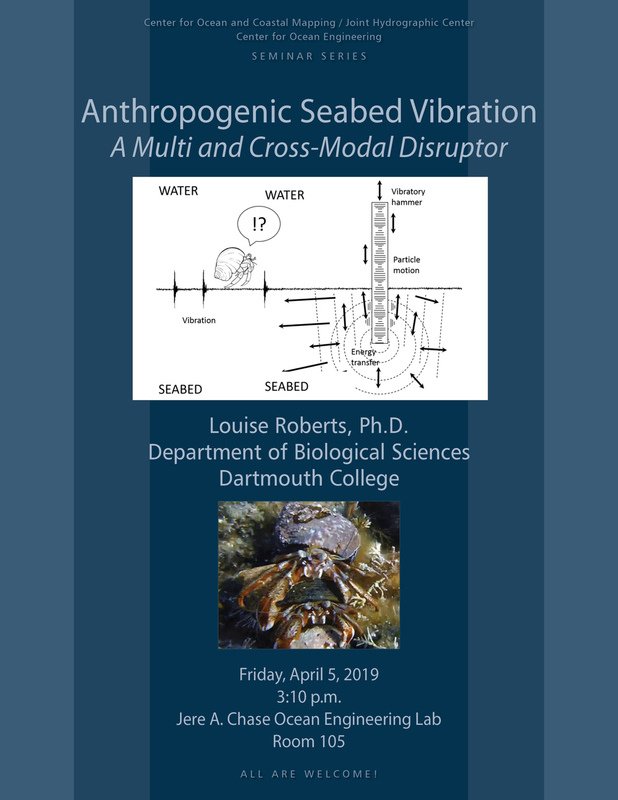 News & Events Seminars Louise Roberts, Ph.D.
Anthropogenic activities directly contacting the seabed, such as drilling and pile driving, produce a significant vibration likely to impact benthic invertebrates near the activity. Vibration is used by marine species in a similar way to terrestrial organisms, for the detection of biotic and abiotic cues, yet the significance of this and the sensitivities to vibration are undocumented for many marine species. Exposure to additional vibration may elicit behavioural or physiological change, or even physical damage at high amplitudes or particular frequencies, although this is poorly studied within underwater noise research. Here the available information is summarised regarding the sensitivities and responses of marine invertebrates to substrate-borne vibration. This includes information related to vibrations produced by those construction activities directly impacting the seabed, such as pile driving. Data so far indicates that these species can detect vibration and respond to anthropogenically-produced vibrations, although the long-term implications of this are currently unknown. Dr. Louise Roberts joined Dartmouth College as a postdoctoral research associate in the summer of 2017, and recently held an adjunct Scientist-in-Residence-Fellow position at Shoals Marine Laboratory for the summer of 2018. She received her bachelor's degree in Zoology from Durham University (U.K.) in 2008, a master's degree in Marine Biology from Bangor University (U.K.) in 2009 and a doctorate in Biological Sciences from the Institute of Estuarine and Coastal Studies at Hull University (U.K) in 2015. After her doctorate, Louise continued at the Institute of Estuarine and Coastal Studies for two years as a postdoctoral researcher whilst also contributing to consultancy projects regarding anthropogenic impacts. Louise is strongly interested in how animals interpret their environment using sound and substrate-borne vibration, with current research focussed upon crustaceans. Her long running research interests regard how anthropogenic noise impacts fish and invertebrates within the marine environment, with her doctorate based in this area. Her postdoctoral research on this topic (most recently at Shoals Marine laboratory) has focussed more specifically upon the impacts of seabed vibration upon benthic animals, an area that has fascinated her for a number of years.